Eritrea (/ˌɛrɨˈtreɪ.ə/ or /ˌɛrɨˈtriːə/; Ge'ez: ኤርትራ ʾErtrā ; Arabic: إرتريا‎ Iritriyā), officially the State of Eritrea, is a country in the Horn of Africa. Eritrea is the Italian form of the Greek name Ἐρυθραίᾱ (Erythraíā ), meaning "red [land]". 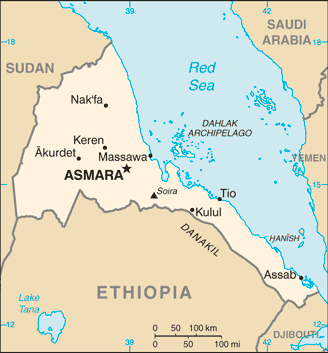 With its capital at Asmara, it is bordered by Sudan in the west, Ethiopia in the south, and Djibouti in the southeast. The northeastern and eastern parts of Eritrea have an extensive coastline along the Red Sea, directly across from Saudi Arabia and Yemen. The nation has a total area of approximately 117,600 km2 (45,406 sq mi), and includes the Dahlak Archipelago and several of the Hanish Islands.